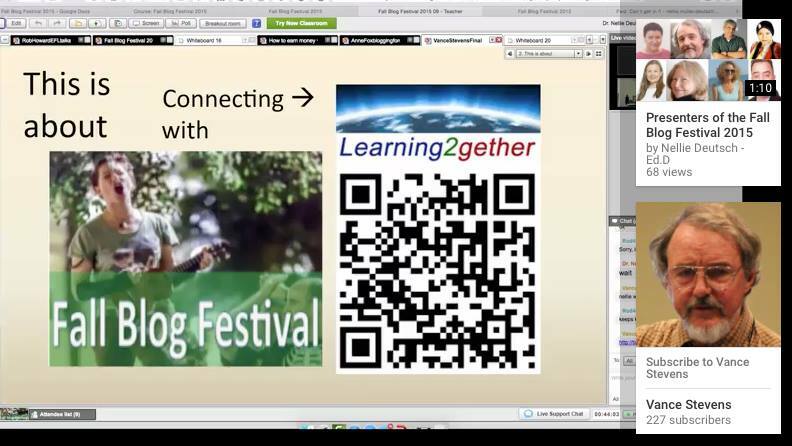 On Sunday September 13 1300 UTC Learning2gether met with Lucy Gray and Peggy George to learn about Global Collaboration Day coming up on Sept 17 http://www.globalcollaborationday.org/about.html, a first annual demonstration of global collaboration for educators, encouraging students, teachers, organizations and companies to host virtual events involving technology on September 17, 2015. Steve Hargadon and I are tremendously pleased with the participation for Global Collaboration Day on September 17th. Approximately 325 schools and organizations and 36 outreach partners from 51 different countries participated in 149 collaborative online events. Many projects were categorized as requiring asynchronous participation, so you may find a few are still running. Save September 15, 2016, as the official date for our next GCD! Our current partner list includes TES, Edmodo, Remind, AFS-USA, iEARN-USA, the Global Campaign for Education – US Chapter, SMART, VIF International Education, and Edutopia. (We would love to add your organization to this list as well. )For further information, please take a look at our website and press release. 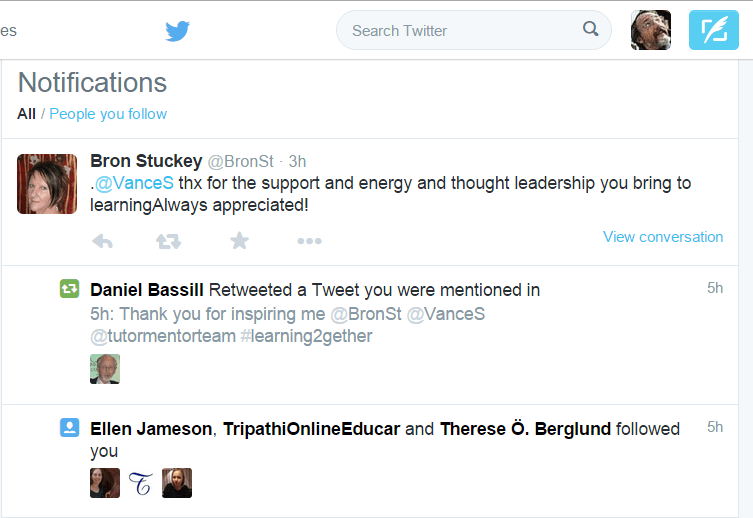 Also, check out this recent article on us from eSchool News and Lucy’s Edutopia blog post. So excited to have you here to share with us today about Global Collaboration Day! My other twitter handle is @elemenous. Yes! Classroom 2.0 with Steve Hargadon back in 2007 was the beginning for many of us on this wonderful adventure with web 2.0 and connecting with educators from around the world! Love hearing this story about how Steve and Lucy got everything started with the Global Education Conference! Thanks Delphine, Robert and Halima for joining us in the Hangout! The Global Ed Conference in November is always fabulous! Amazing that 10,000-15,000 people participate every year! Dates? Sometime in November, right? What is the today’s topic on? love the idea of extending the global events throughout the year and not just during the conference! Remind is such a great tool for sharing resources, reminders about the event! I love getting my daily remind messages from Lucy! It’s great that you can choose your own time zone on the schedule so you won’t get confused about the time. Peggy cannot open Your site! How is that spelled? Youcanbookme? How do I use the effemeral chat in the HoA? Now, I see. I just didn’t have the Group Chat tool open. Yes, I know; that’s why I was looking for how to say hi back. which site can’t you open Halima? the main site for Global Collaboration Day? it may be a bandwidth problem since you are also in the Hangout and that takes a lot of bandwidth. What if I’m not with a school or organization now? Is Lucy going to do a screen share, or what? Think I’ll volunteer for the November gig. Is Global Ed site mobile-friendly? Can I access on my iPad? Really glad I was able to join the conversation. 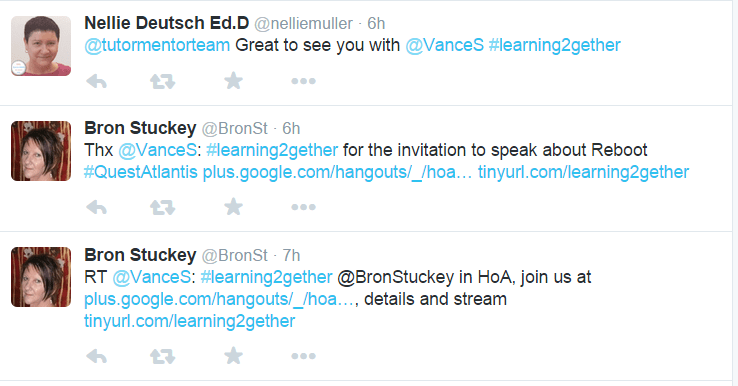 so many fantastic opportunities for all of us to learn and share together through these free conferences and webinars!! Thanks for coming everyone. And thanks for having me, Vance! Invite me to to future events, I’d like to listen to more conversations rather than talk! Thanks so much for joining us Robert! I’m listening to the recording of the hangout now. I joined Classroom20 many years ago and also host a Ning platform. Hi Nellie! Great to see you! youcanbookme is an amazing scheduling tool! it’s really easy to use as a presenter! Hi Lucy, Vance, Peggy, and ??? Yes, Peggy. I know the tool. What kinds of problems did you have Halima? are you talking about the form to participate? wow! a nobel prize winner!!! hope that works out! Where are you based now, Robert? Lucy and Peggy Thank You for informing about all updates of events! I’ll be in India on October 16. I’m n the Philippines. been here for nearly 2 yeears now. Going to Nepal the end of this month for about a month. Yes. we just visited Cambodia and Vietnam last month. Dr Nellie!!!! You are in heavens and poor me!!! I’m not that happy with Facebook, Halima. Yes, I noticed the changes on the Ning. you can also sign up to help as a volunteer moderator during the Global Education Conference to help moderate Blackboard Collaborate sessions. I love doing that rather than being a presenter. I’d love to be part of that, Peggy. Peggy cannot open Your site! How to E-mail to You? There are many opportunities to volunteer for the K12 Online Conference either as a presenter or helper. There is an Organizer team and a number of different committees. Everything is pretty much in place for this year for K12 Online but watch for the volunteer webinar next year to see how to get involved. I’m available this year. I have no idea about next year. which site are you having trouble getting into Halima? Nellie is definitely a connected educator leader around the world!! it’s one educator at a time and a very slow process. 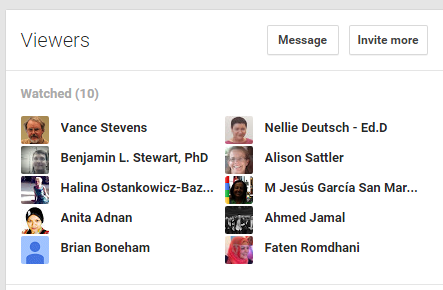 My weekly webinars that I host on Classroom 2.0 LIVE often have 8-10 people each week from other countries! but Peggy, how many turn up in total? Halima, that is my “About.me” page. Is that the link that won’t open for you? Nellie, each week we meet on Saturdays and often have between 30-50 people. We record everything so many people also watch recordings if they can’t make it on Saturdays. I often go back to watch recordings from previous years! I also love to be able to invite presenters to come and do their presentations for us on Classroom 2.0 LIVE if I think it is something our participants might really find valuable. Lucy, where are getting funding? I self-fun and it’s getting hard. Steve hosts a LOT of virtual conferences each year!!! there is almost one every month of the year! Is Global Ed site mobile-friendly? Can I access on my iPad? yes it is Robert (website). Are you referring to Blackboard Collaborate or the website? Thinking I’d like to listen to sessions while doing the dishes, etc. Peggy PLZ,POST here Your E-mail! Peggy, I lost the link to the calendar? I’ve got a laptop I can use, too. but I usually have my iPad in the kitchen, just easiest. Where do we add to the calendar? fortunately we don’t have to understand how Google Calendar works (behind the scenes) to make it work. It just works! 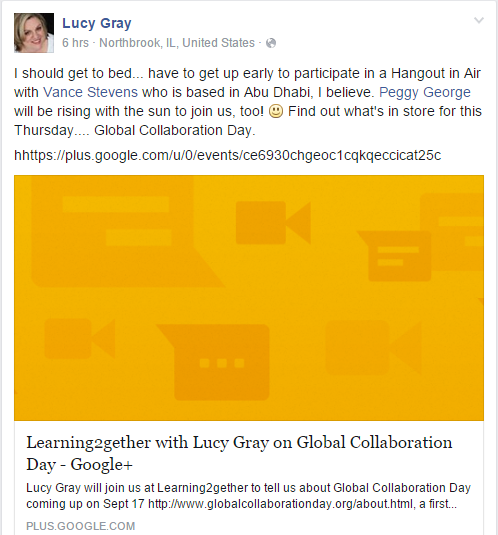 Susan Gaer has given online workshops on Google Calendar, Vance. there’s a suggestion Robert, L2g session lead! Nellie are you a partner with the Learning Revolution? You could share your calendar with them too. Halima Ozimova left group chat. Halima Ozimova joined group chat. everyone helps each other out! there is no charge to be a partner Nellie. Sponsors provide financial support. What’s the timeline for volunteer/moderators? When do people need to start getting involved? Orientation? thank you, Nellie. I got it into my calendar. I’ll be in Nepal in Oct.
I’ll be back home about Nov. 7. It has been really great to hear you describe the Global Collaborate Day and the conference Lucy!!! Really informative and now we’ll be able to share the recording link with other people who couldn’t join us. seeing and hearing you great Robert! a wonderful time to listen your sharing. thank you for all sharing. early to leave it for something to be done. bye! Delphine Chiao left group chat. so many fantastic opportunities for us to connect with each other for professional learning! See you online next week and in November! I get some of my best geography lessons from Vance! I’ve been going to ISTE every year since 2005! Thanks, Everyone. I’ll definitely check out events o the 17th and sign up to be a volunteer in Nov.
Will keep a journal and take lots of photos to share in Nepal. thanks for your willingness to volunteer Robert!! Glad to help out; sounds like a great way for a mostly retired educator to be involved. DESPITE FEELING MYSELF LIKE among GURUS i nevertheless try too! I”m going to say good night (10 p.m. here) and see if I can listen to a Global Ed session while doing the dishes! May I say THANK you!!! the video part of virtual conferences is so valuable because we can see places and people we would never be able to meet face to face! love being able to see classrooms around the world in these virtual conferences! Diving into the archives of sites like Classroom2.0, Webheads, and my own sites offers great value, but we’ve not figured effective ways to encourage and facilitate that. E4.123-0156: Flipped lit projects. 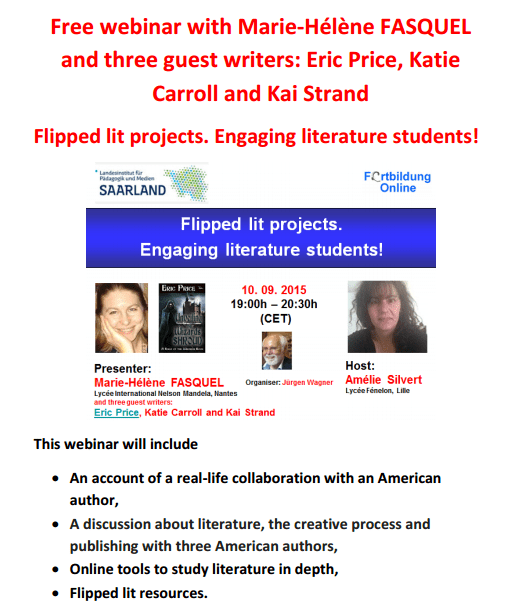 Engaging literature students! Rick Noll Owner and one of the developers of ActiveWorlds, Inc.
For the past decade there was a vast educational research project taking place in classrooms on 6 continents. 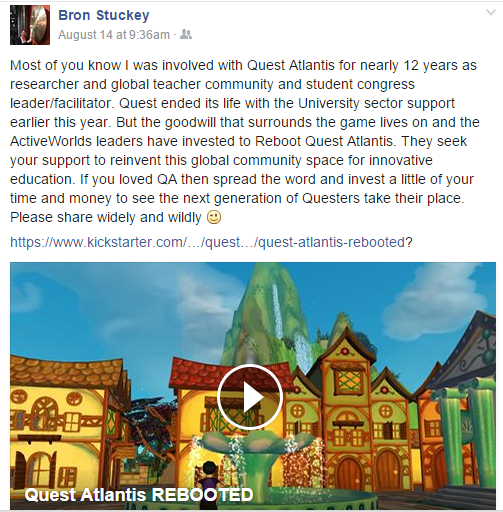 It was Quest Atlantis, a massively multiplayer online game integrating strong support for 21st century skills into each subject. Teachers, students, and researchers alike hoped that Quest Atlantis could grow, and other students could share the experiences they loved. Some parts of the project moved forward, but as grant funding for the multiplayer platform drew to a close, the team couldn’t keep the game ready for today’s classrooms. As the developers of the engine that ran Quest Atlantis, we’ve always been excited to see what students were able to do, inside the game and out, and we listened when teachers told us they didn’t want to see it go. We’re working hard to bring it back for a new generation, in collaboration with members of the original Quest Atlantis team. If you brought your students in to Quest Atlantis – or if you were a student there – you know that the community formed around reading, writing, building, sharing, and saving the world together was special. You know there was potential for much more to unfold – more for students and teachers to create, more features to make the right tools available. 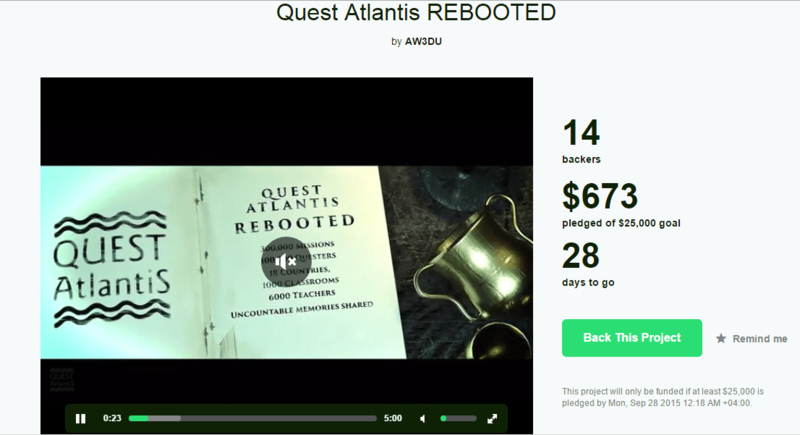 Make your pledge and help us bring a new Quest Atlantis to a new generation! Daniel F. Bassill – I’m listening in from Chicago. Is this the best place to ask questions or comment? do you want to join us here? can you see the direct link? Daniel F. Bassill – I can listen in. The video works fine. Daniel F. Bassill – I’m on the webheads page and listening to speaker. Is this the Quest Atlantis project? Daniel F. Bassill – Ok. I’m on the Google hangout now. Daniel F. Bassill – I logged out and in. Still don’t see my icon, but that’s ok. I was intending to listen and offer comment via chat anyway. 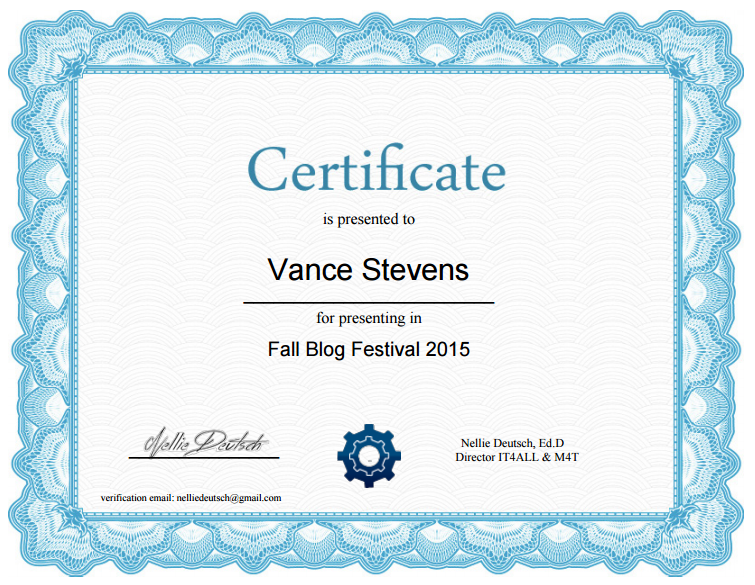 Vance Stevens – are you sharing your screen inadvertently perhaps? Daniel F. Bassill – I don’t know. Don’t know how to check that. Vance Stevens – I see an icon with your name on it … move your mouse to the left edge of the HoA window and find the green screenshare icon with the white arrow, try and toggle it off ? 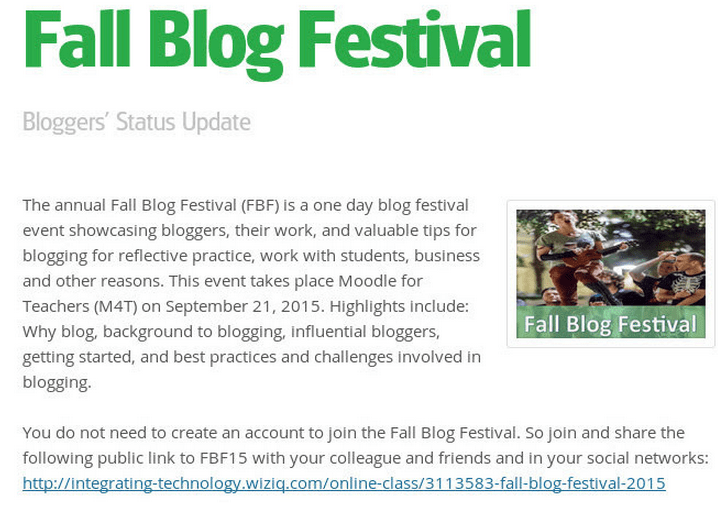 Daniel F. Bassill – I clicked on the green icon and it was inviting me to share my screen. I can see that in my icon space my screen is being shared. It’s not a problem to me. Vance Stevens – hi nellie, have you found he hangout link? Daniel F. Bassill – What’s the web site for Alphaworld? Nellie Deutsch, Ed.D – No, Vance. I didn’t see the chat anymore. Nellie Deutsch, Ed.D – I ‘m listening via the hangout, but didn’t see a link to the chat. Haven’t heard from Chris for some time. I hope he’s ok. I remember Quest Atlantis from way back. Ellen Jameson – Saw Chris at SXSWedu, he and EcoMUVE are doing well! Ellen Jameson – Hi Nellie! Bron Stuckey – #ActiveWorlds has redeveloped the Rhino World but it needs #QuestAtlantis framework to give it curriculum value. Nellie Deutsch, Ed.D – again, what age group are we talking about? Daniel F. Bassill – This issue of funding continuation is something I’ve focused on for nearly 20 years. I faced it in the programs I was leading and recognize that everyone else faces same challenge. Thus my on-line connections seek people working to fix this problem for all of us, not just for themself. Hard to find such people. Vance Stevens – I think this is for K-12, am I right? Nellie Deutsch, Ed.D – how about happiness, doesn’t that rule? Nellie Deutsch, Ed.D – is it for 18 year olds? Nellie Deutsch, Ed.D – is it on a wiki, too? Nellie Deutsch, Ed.D – That’s good to hear, Daniel. Nellie Deutsch, Ed.D – Thank you, Vance. I’m also watching TV so it’s kind of noisy here. Vance Stevens – what is its advantage? Nellie Deutsch, Ed.D – Zoom is free for 25 for 45 min and you can have 25 webcams running. Its very open. Daniel F. Bassill – Minecraft seems to be well-supported, and promoted, by YouTube videos that show “how to” build things. My son has watched these for a few years. Building something that has the same appeal, and the same level of YouTube activity, would be key to making this widely used. Nellie Deutsch, Ed.D – Ok, I’m inspired. How do I get involved? Daniel F. Bassill – Is there a Google community for this? A Facebook community? Daniel F. Bassill – On Kickstarter, do you need to reach your $25k goal or can you keep whatever you raise? Bron Stuckey – No #ActiveWorlds set a low goal but hope to massively exceed it. It’s more about community ownership! Daniel F. Bassill – People need to get paid in order to stay involved and give their time and talent. Is there a business plan that shows how fees for use might generate enough revenue for future development, training, marketing, etc. Nellie Deutsch, Ed.D – have you considered organizing a MOOC? I can help with that. 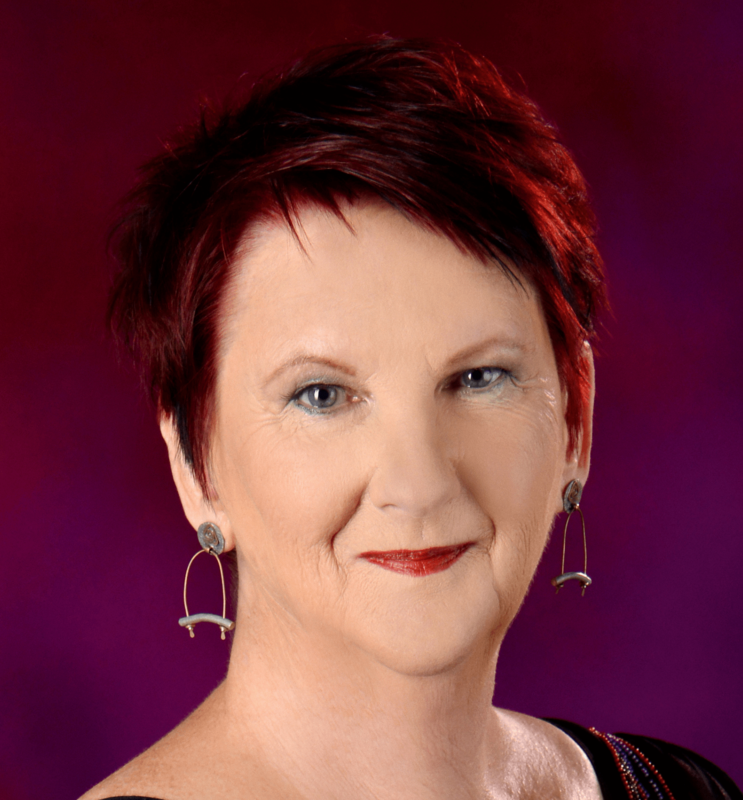 Bron Stuckey – Great idea Nellie! Nellie Deutsch, Ed.D – We can get the word out that way. Nellie Deutsch, Ed.D – Train current and future teachers on how to use it. 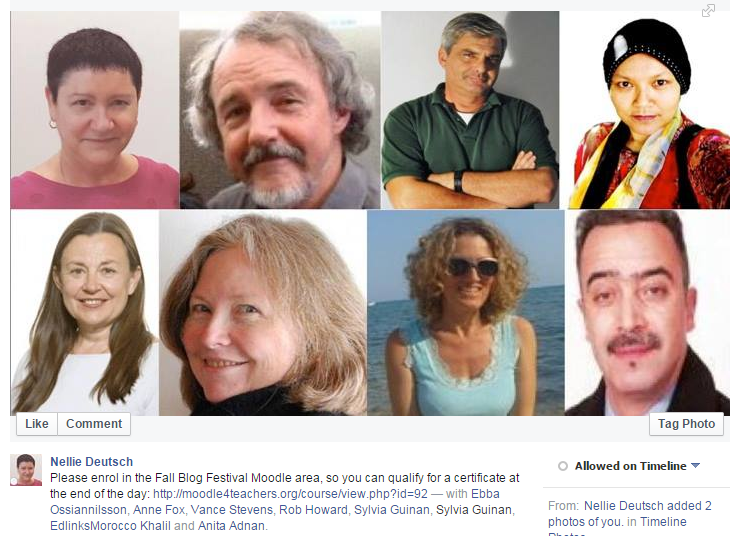 Daniel F. Bassill – I’ve been part of some cMOOCs over past few years, such as Deeper Learning, Education Technology & Media. Format is good and can be on-going. Nellie Deutsch, Ed.D – I’m thinking of the old fashioned MOOCs, Daniel. I’m an educator and I know a lot of teachers from around the world. Nellie Deutsch, Ed.D – QA would be great for EFL learning. Nellie Deutsch, Ed.D – I asked if there is a wiki? Rick Noll – to QA? Daniel F. Bassill – Minecraft has millions of users who have become self motivated to spen countless hours playing the game. If educators had resources that motivated as much student use, and could show measurable learning outcomes, this would be a home run. It’s possible that the more this appeals to educators the less it will appeal to learners. Nellie Deutsch, Ed.D – Wikis are becoming less popular, but they are great. Daniel F. Bassill – I encourage you to move quickly into social media and/or a MOOC and try to attract those 25k past users into participation. Just building those numbers can help you demonstrate value to potential donors/investors while offering loads of talent to help you. Nellie Deutsch, Ed.D – I’d like to get involved. I’m freer these days so try me. 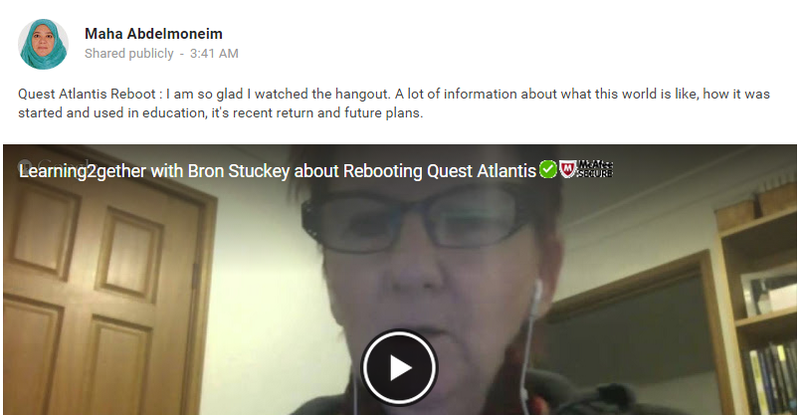 Bron Stuckey – There is a #QuestAtlantis Facebook page Quest Altantis Teachers for anyone who has used or wants to use it. Daniel F. Bassill – Thank you. I’m @tutormentorteam on Twitter. Let’s connect. Nellie Deutsch, Ed.D – I’ll connect on Twitter, Daniel. Nice seeing you everyone. Game Jams: Excite Your Students While Teaching 21st Century Skills. The ELT cyber faculty lounge returns as many teachers and students around the world get ready to head back to the classroom. All are welcome to join in and share ideas, questions, and collaboration thoughts for the coming semester.